Primary: Crime scene investigators and those in training, medico-legal investigators, forensic science labs and forensic science programs. Secondary: Law enforcement officers, fire fighters and investigators, accident investigators, private investigators and attorneys. A member of several professional organizations, he has been a consultant for and appeared on the “On the Case with Paula Zahn” television show. He has traveled to the Bahamas, Mexico, and extensively throughout the United States to various Police Departments to train their patrolmen, detectives and investigators in the proper techniques used as first responders and crime scene investigators. Other specialty topics include shooting reconstruction, blood spatter pattern analysis, trace evidence, and finger printing. He has also been a co-author on a chapter on handling of forensic botany evidence in Forensic Ecology Handbook: From Crime Scene to Court. Peter’s interests include examining the value of standardization of crime scene investigation training and methods and new technological advancements in crime scene investigation. 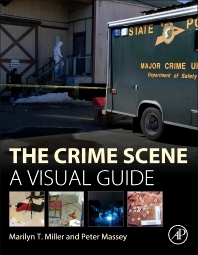 This book is very helpful for Scene of Crime with clear photography. It's writing materials is also very good.